I recommend EMF meters in many of the articles here on EMF Academy, and for what I think is a very good reason. If you’re here, reading this article, I’m going to assume you already have a baseline understanding that EMF radiation from devices like your cell-phone, laptop, tablet, etc is dangerous. With that understanding, the absolute best tool you can arm yourself with is a quality EMF meter, that is accurate, simple to use, and measures all types of EMF radiation. In this enormous guide, I’m going to share with you what I think are the absolutely the 5 best EMF meters and detectors you can purchase in 2019. Don’t worry though, I’m not going to leave you stranded. I’ll also thoroughly discuss why each meter was chosen, what it’s capabilities are, and why it might be a good fit for you. After we get done reviewing and talking about the EMF meter choices, we’ll go into a bit more depth about why an EMF meter can be such a valuable tool in your fight against EMF radiation. Why Do I Need An EMF Meter? Let’s jump right into the reviews! You’ll notice that the meters are certainly not ranked just based on most expensive to least expensive, and that is for good reason. For example, the Trifield TF2 is my number one recommendation but is much more affordable than, for example, the Acoustimeter AM-10. Although the Acoustimeter is a fantastic device, I believe the Trifield delivers a fantastic product at less than half the price. These rankings are therefore a cumulation of all of the factors bulleted above. With that in mind, this list, although thoroughly researched and designed, is open to interpretation. I’d encourage you, if you disagree with my review or ranking, to let me know in the comments, or by emailing me personally at Christian@EMFAcademy.com and let me know your thoughts. I was not gifted any of the devices I review in this article, nor have I communicated with any of the companies. My rankings and reviews are based entirely on my own use of the products, experience, research, and opinion. If you’ve been around EMF Academy long, you know that I love to recommend the Trifield TF2, and I think it’s for a good reason. The TF2 is Trifield’s follow up to the wildly popular 100XE model that had an analog needle display, but similar functionality. The TF2 brings some much-needed modernization to an already fantastic EMF meter. I won’t go too in-depth about the product in this post, because I already wrote up a full review of Trifield TF2, however, I do want to give you a good understanding of why I love this EMF meter so much, and why it is the one I find myself using for just about everything. Let’s start by talking about some of the features. *New* weighted mode is specifically designed to measure EMF radiation in the human body. The “Magnetic” setting uses a 3-axis sensor. This allows you to get accurate readings regardless of which way you’re pointing the meter. Brand new LCD display offers much more information than the 100XE was able to, making testing a breeze. Since there is a digital display, there is also a backlight which allows you to get readings even in low-light settings. The TF2 now has an audio output to help you hear the EMF radiation around you. This can be extremely helpful for locating sources of radiation in your home. 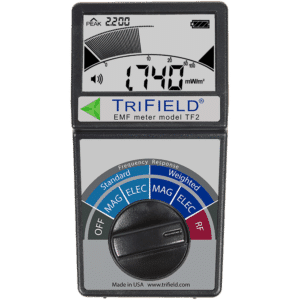 The Display – I personally love the display of the Trifield TF2 more than any of the other EMF meters on the market. It provides an enormous amount of information in a way that is simple to find and easy to understand. The Price – The TF2 is very competitively priced, and honestly is an absolute bargain for what you get. Trifield meters are famous for their construction quality, so expect to not have to replace this meter any time soon. User-Friendly – Whether you are an expert on EMF radiation (perhaps you’ve read all the content on EMF Academy 🙂 ), or you’re just starting out, the Trifield works well for both. 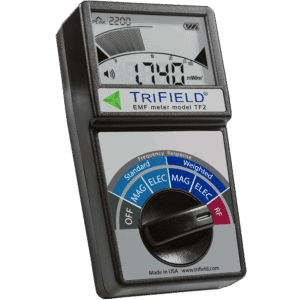 Trifield meters have long been popular because they are very simple to operate, making them great for beginners, but also have the accuracy and functionality that professionals are looking for. I personally think with the added LCD display, and “peak” indicator, the TF2 is an even easier unit to operate. Measures All EMFs – This was one of the main reasons I recommended the Trifield 100XE in the past because it measured magnetic, electric, and radio frequency radiation, when some other meters did not. If you care about EMF radiation in your home, you need to be able to measure all types of radiation. Audio And Backlight Buttons – I found it a bit frustrating that both of these buttons can only be accessed by removing the battery cover. I think they were trying to maintain a slick and simple look by only having the dial on the front of the unit, however, I wish that they had made these two buttons easier to access. The best place to get the Trifield TF2 is on Amazon. Feel free to take a minute and read through some of the 5 start reviews. However, remember that this new version hasn’t been around long, so there aren’t all that many reviews yet. I don’t’ want to bore you with all of the specs, if you’re curious about them head over to my full TF2 review, I’ll just give you a few important highlights. Here is a nice video showing the Trifield TF2 in action to give you an idea of how it works. I honestly wouldn’t rate the Trifield TF2 my absolute best EMF meter in 2019 if I didn’t truly believe in the product. 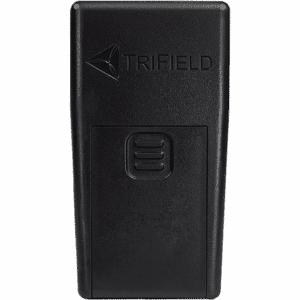 I’ve used many EMF meters, and I always find myself going back to the Trifield. The price is extremely reasonable, and you honestly will love how accurate and simple to operate this device is. There are other great EMF meters on the market that we’ll talk about next, but this is my #1 choice. Check out the Amazon listing here. 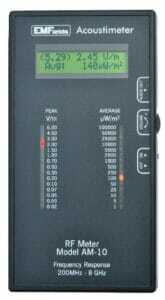 The Acoustimeter is probably without a doubt the best Radio Frequency (RF) meter on the market. It is extremely accurate, simple to use, and preferred by professionals. However it does have its downsides, for example, it only reads RF radiation, and is not designed to read electric field or magnetic field radiation. We’ll talk more about the positives and negatives of the Acoustimeter in a second, I just want to say that if you are looking strictly for an RF meter, this is the one you need. There is a reason that you will see the Acoustimeter AM-10 in the hands of so many professionals, it is extremely accurate and simple to use. Let’s talk a little bit about why this might be a great meter for you. Sensitivity – To start with, the Acoustimeter is one of the most sensitive RF meters on the market, capable of reading even the smallest amounts, of the lowest radio frequencies and displaying them. Not only that, but it also has fantastic directional sensitivity. This will allow you to easily locate the direction that the largest RF radiation sources are coming from by simply moving your Acoustimeter in a circle and watching the display to see peak readings. I have a great guide on how to see a map of every cell tower near your home. You’ll find that if you pull that map up, and locate the nearest cell tower, your Acoustimeter should show the highest readings when pointed towards it. This demonstrates the Acoustimeter’s ability to help you locate dangerous sources of radio frequency radiation. You are also likely going to be able to locate things like your neighbor’s WiFI router, that is how sensitive the Acoustimeter can be. Frequency Range – The next thing I really like about the Acoustimeter is its enormous frequency range that it is able to measure. For example, the Trifield TF2 is capable of reading up to 6Ghz (which for now is probably plenty) whereas the Acoustimeter can read all the way up to 8Ghz, giving you a wider range that you are able to measure. Ease Of Use – Next, the Acoustimeter is really simple to use. There is a simple display at the top, as well as two rows of LED lights below. When using the meter, I personally like to plug in a pair of headphones into the audio jack (with or without the headphones) and use the audio to help me locate sources of RF radiation. Once I hear some noise and know that there is RF radiation near, I primarily look at the lefthand row of LED’s, which shows the peak V/m readings. The 5.29 in brackets is showing you the “peak hold” reading in V/m, which is the highest reading that has been recorded since you turned the Acoustimeter on. The 2.45 is the current peak signal strength measured in V/m, which will correspond to that left row of lights. The 140 µW/m2 is the average reading measured in microwatts per square meter and will correspond to the right row of lights. Overall I find the Acoustimeter really easy to use, especially once you get a used to it. Cost – First of all, it is a fairly expensive device relative to its features. At more than double the price of the TF2 (at the time of this writing), you certainly want to make sure this is the device for you before purchasing. I’m not saying that it isn’t worth the price, because honestly for the right person it absolutely is. Just understand that you are paying for the accuracy and quality of the machine, not for bloated features. Size – Next, the device is relatively bulky. I’m hoping that future models are designed a little bit slimmer and sleeker. Limitation – It is unfortunate that the Acoustimeter only measures RF radiation, and not magnetic or electric. This is intended, as this meter is entirely focused on being a top of the line radio frequency meter, however it means that to measure all forms of EMF radiation you’ll need more than one meter. Overall I think the Acoustimeter is a fantastic device and the best Radio Frequency meter on the market in my opinion. It’s simple to use, extremely accurate, and a very sturdy device that should last a very long time. If you’re interested in purchasing the Acoustimeter, the best place to purchase it is right here on Amazon. 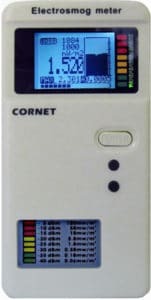 Other than the Trifield TF2, the Cornet ED88T might be one of the most popular EMF meters on the market. In terms of features and price, it’s actually quite similar to the TF2, but there are a few reasons I’ve ranked it a bit lower. All in all, it’s a quality meter by a great company that I don’t think you’ll be disappointed with. Let’s jump right into talking about some of the things I like and don’t like about the Cornet ED88T. Measure All EMF Radiation – First of all, just like any great EMF meter, the Cornet ED88T measures all three types of EMF radiation, including radio frequency, magnetic field, an electric field. This, in my opinion, is one of the most important features of a good EMF meter, as you’ll want to know the measurements of all three when measuring your home or office. Radio Frequency Sensitivity – Other than the Acoustimeter, the Cornet ED88T is probably the next best meter for detecting Radio Frequency radiation. It has a similar range of 100MHz – 8GHz and appears to be extremely accurate. This is partly due to its extremely fast sampling rate of 10,000 samples/sec. Sound Feature – I like that the Cornet does feature a sound output for Radio Frequency radiation readings, which I personally find extremely helpful when measuring radiation in a space like a home or an office. Reading History – This is one of my absolute favorite features of the Cornet. While you’re using the meter, it displays the last 30 readings, so you can look back and find spikes after scanning a room or a home. This can be especially helpful for getting readings from things that have a tendency to pulsate, such as Smart Meters. Smart meters usually have extremely high spikes or radiation when transmitting information, however, this occurs very quickly and it can be hard to get an accurate reading. With the Histogram feature, this is a piece of cake and you can easily look back at the reading. Ok, now let’s talk a little bit about some of the things I don’t really love about the Cornet ED88T. User Friendliness – I don’t personally feel like the Cornet ED88T is all that user-friendly. There are only a few buttons, which you would think would be a good thing, but it is not clear what they do, and I found that when first using the device I was stumbling around a bit. In contrast, I found the Trifield TF2 to be almost impossible to not use correctly, as you simply turn the large dial on the front to what you want to measure, and off you go. I also felt like the user manual that comes with the Cornet ED88T was not all that helpful in showing you how to properly navigate the device. Units of Measurement – I personally prefer to read magnetic fields in milliGauss, however, the primary reading number of the device is in Tesla (it does show the mG, however, it’s the smaller number below the larger Tesla number). This also can’t be changed, you’ll always be looking at the smaller number to find the milliGauss. All of the other units of measurement displays can be changed in the settings luckily. The Cornet ED88T is a very popular meter and preferred by many professionals over meters and detectors like the Trifield TF2. It does have some unique functionality, like reading the frequency range of Radio Frequency. I personally don’t find it as user-friendly as the TF2, but it is an extremely high-quality meter with very similar functionality. I certainly don’t think you’ll go wrong if you purchase the Cornet ED88T. If you’d like to purchase the Cornet ED88T you can pick it up on Amazon. Next, I want to take a look at the Meterk, which is on this list primarily because it is, in my opinion, the best budget-friendly EMF meter on the market. I won’t go into too much detail about the Meterk here, as I have an entire review you can check out if you’re looking for more information. If you check the price on Amazon, you’ll see that this device falls FAR below the other meters we’ve talked about in this article. Now there is a reason for this, the Meterk does not have nearly the features or build quality of these other meters, however for the price, I think it is the best on the market. This is also a fantastic EMF meter if you’re someone with little experience, that does not feel like spending a significant amount of money on an EMF meter right away. This allows you to get a feeling for how these devices work, the information they can provide you, how that information can benefit you, etc. Later down the road after you realize how important these devices are, you can opt for a bit higher quality, more feature-rich device like the Trifield or the Cornet. Let’s talk about some of the reasons I think the Meterk is a good value for the money, and then we’ll talk about a few of the things you’ll find are missing from this EMF detector. Price – Obviously the most obvious benefit if the Meterk EMF meter is it’s extremely low cost. There are a few reasons for this, with the largest being the fact that it is developed and manufactured in China, so they are able to produce it at a very low cost. This can also be a bit of con, which we’ll talk about below. All-in-all though you won’t find an EMF meter on the market with reasonable functionality, and good reviews, that is less expensive than the Meterk. Sleek Design – I have the Meterk meter, and I can tell you that it is even smaller and lighter than you would expect, in fact, it’s almost identical in size to an old Nokia brick phone, if you remember those like I do (playing snake!). 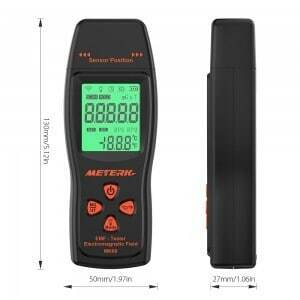 Easy To Use – The Meterk EMF meter is really easy to use. With a simple to understand LCD display, as well as a full range of buttons, it’s pretty simple to operate. It also has a nice bright green screen that turns red when readings get high. An audible alarm will also sound to alert you that you’ve encountered dangerous amounts of EMF radiation (don’t worry, you can turn the audio off if it gets annoying. No RF Reading – The biggest downfall of the Meterk is that it only reads magnetic and electric field radiation, not radio frequency radiation. However, this does mean that the Meterk could be a really good compliment to the Acoustimeter, which reads RF, but not electric or magnetic radiation. Not Tri-Axis – Whereas many of the EMF meters on this list have tri-axis capability (meaning they will get an accurate reading regardless of orientation), the Meterk requires that the sensor (located on the right-hand side) is pointed towards the source of the radiation to obtain an accurate reading. Quality – I cannot say that the Meterk is made of the highest quality. I have owned it for quite a while without issue, but it is not from a long-standing reputable company like Trifield, Acoustimeter, or Cornet. This also means that the accuracy is likely to be less reliable than these higher quality meters. The Meterk EMF meter is without a doubt the best budget meter you can get in my opinion. 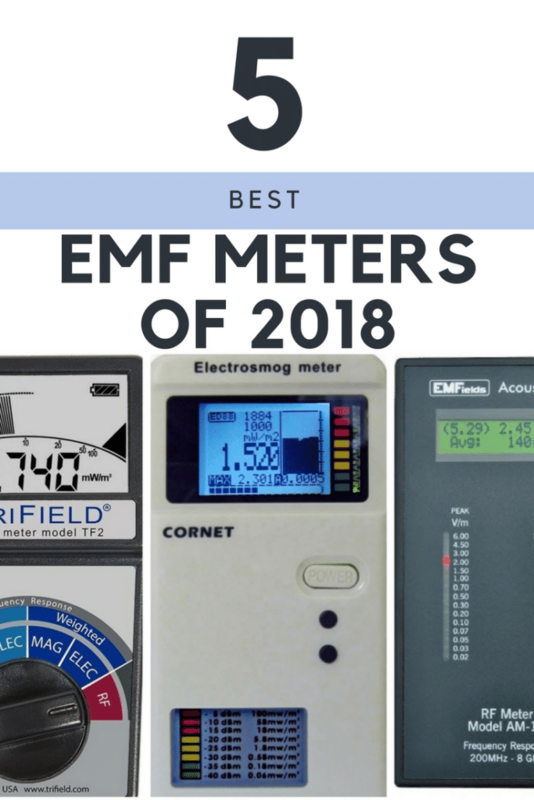 Although it lacks the quality and features of the other meters on this list, it is a great choice for your first EMF meter. You can pick up the Meterk on Amazon. The Latnex is a great radio frequency meter and is sort of a budget version of the Acoustimeter. Offering only radio frequency radiation detection, the Latnex does not offer a full range of detection but does some great quality for a reasonable price. I’ll just interject here, that in my honest opinion, I don’t think there is much reason to purchase the Latnex over the Trifield TF2, considering the similar price, and extra features you get with the Trifield. Let’s take a look at some of the features I like about the Latnex HF-B3G. Triple-Axis – The Latnex does have a triple axis radio frequency detector (the ball on the top of the device) which allows you to get accurate readings regardless of the orientation of the device. Great Manual – The Latnex comes with a very detailed user manual (see that here) that really comes in handy. I find the manual to be even more thorough than the manuals that come with some of the higher quality meters. Easy To Use – With a simple display and 7 nicely labeled buttons, the Latnex is a breeze to operate. Only RF Readings – Obviously the largest downside of the Latnex is simply the fact that it only reads RF radiation. Like the Acoustimeter, this is how the device is designed, but it is certainly nice when the meter measure all types of Radiation like the Cornet or the Trifield TF2. Quality – Latnex, although they make a variety of EMF meters including ones that measure magnetic field radiation, it has not been around as long as some of the other companies. This makes me doubt the reliability a little bit since it has not stood the test of time. The Latnex is a great radio frequency meter with great reviews. However, I’d encourage you to look at some of the other options. If you’re wanting a high-quality RF meter, go with the Acoustimeter. If you’re wanting a reasonable price EMF meter that still has great RF functionality, go with the Cornet or the Trifield. That is just my honest opinion and suggestion. 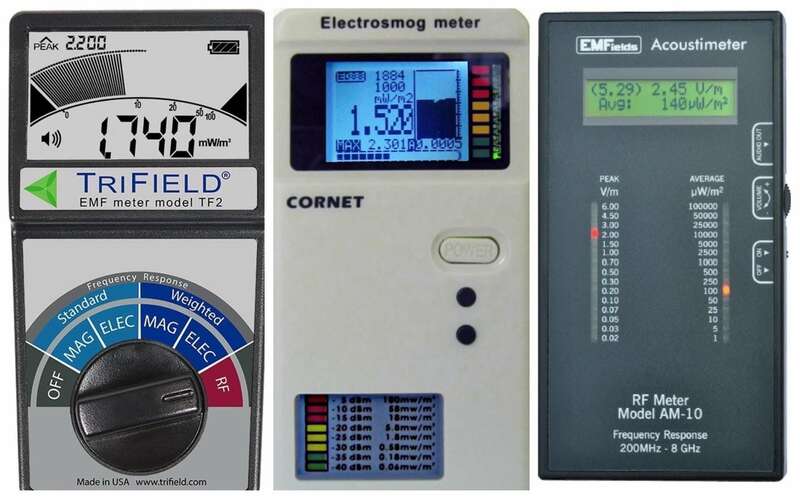 Ok, now that we’ve made it through our list of the 5 Best EMF Meters of 2019, let’s talk a little bit about the reasons you might want to get an EMF meter in the first place, and why it is such a valuable tool. There is a good reason I’m always suggesting people purchase an EMF meter once they understand how dangerous long-term exposure to EMF radiation is. With a quality EMF meter, not only can you gain a thorough understanding of the type of EMF radiation in your home, but also the amount. Here on EMF Academy, I have all sorts of guides on how to lower EMF radiation risk in your house, such as my Whole House EMF Protection Guide. These guides offer tons of solutions to lower your exposure, but without an EMF meter, it is difficult to get a real understanding of how much radiation exposure you actually reduced. You can use the meter to detect large exposures of magnetic field, electric field, or radio frequency radiation in your home, apply a solution, and test how much the solution reduced the risk. EMF Meters are also fantastic for testing how well some EMF protection products work. For example, SafeSleeve (see my review) has a line of cases for cell-phones, tablets, and laptops. These are great examples of products that you can test with your EMF meter. Simply start by making a call on your cellphone and measuring the radiation levels. Then, put your phone inside the case, and measure the radiation levels again to see how much radiation it will be protecting you from. There are so many other reasons that you should consider getting a quality EMF meter that I can’t cover them all here, but suffice it to say that it will be one of the best decisions you make on your EMF protection journey. What About Dirty Electricity Meters? Dirty Electricity is an entirely different, although equally important, subject. Dirty electricity is essentially leftover electricity that was not able to be utilized because modern electronics alter the electricity they receive from the wiring in your home. This electricity then sits in your wiring, emitting large amounts of EMF radiation. Dirty Electricity Filters – A Complete Guide (Check out this one if you want to read about dirty electricity meters and filters. Phew… You did it! If you made it here then you just read well over 4000 words about EMF meters, good for you! I hope if you’ve read this far you have all the information you need to make the best decision for YOU. That is an important point because although I rated the Trifield TF2 the best EMF meter of 2019, that does not necessarily mean it is the best option for you and for your needs. That is why I went into so much detail in this post so that you would be able to make your own decision. Ultimately there are many good EMF meters on the market, and honestly, it can be a bit intimidating to select the right one, which was my driving force behind creating this guide. I wanted to cut out some of the confusion and fear from buying an EMF meter, and just help you to get one into your hands! A quality EMF meter is without a doubt one of the most important tools you will ever own for the fight against EMF radiation. With the upcoming rollout of 5g and more and more smart electronics introduced around us, you can be certain that it will be a fight. You need to be armed with the right education, and the right tools. From the bottom of my heart, I hope this guide was helpful to you. If for any reason it was not, please leave a comment, or email me at Christian@Emfacademy.com and let me know what I can do to improve it. Don’t Forget To Pin It On Pinterest! I created and currently manage EMF Academy, one of the premier sources for EMF safety knowledge. I am so passionate about spreading this crucial information. If you need anything, just shoot me an email at Christian@emfacademy.com and I'll do everything I can to help.